Place wooden skewers in water and soak for a minimum of 15 minutes to prevent from burning. Slice sausage into 1/2- inch coins. Slicing is easier if sausage links are partially frozen. Remove seeds from peppers and cut into 1- inch portions. Clean onion and cut into eighths. Place onions and pepper into a bowl with Italian dressing and marinate at least 1 hour. 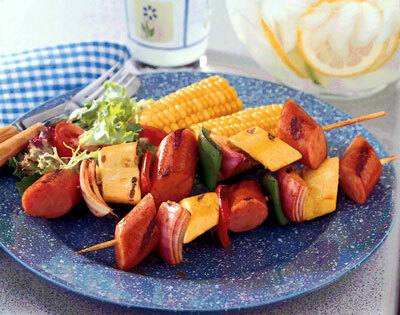 Assemble kabobs by placing a slice of sausage, pepper, and onion onto skewer and repeat until all ingredients are used. Place kabobs on grill rotating often for even grilling. Baste with extra Italian dressing to add more flavor. Continue until vegetables are soft and sausage is cooked; about 15 to 20 minutes.